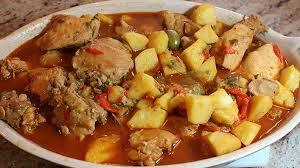 Gallina En Fricase (Chicken Fricassee) - Tienditadepuertorico.com - Buy Puertorican Food Here!! Rinse chicken under cold water and pat dry. Rub chicken pieces with garlic. Sprinkle with adobo and oregano. Pan fry chicken over medium heat, turning ocassionally, until golden brown. Remove chicken to a platter and cover to keep warm. Add onion and sofrito to skillet sauteing until softened. brown sugar, and worcestershire sauce. Bring sauce to boil, lower heat, simmer covered 40 minutes. Ten minutes before serving add pimientos and peas.